In computer networks, a reverse proxy is a type of proxy server that retrieves resources on behalf of a client from one or moreservers. These resources are then returned to the client as though they originated from the server itself (or servers themselves).While a forward proxy acts as an intermediary for its (usually nearby) associated clients and returns to them resources accessible on the Internet, a reverse proxy acts as an intermediary for its (usually nearby) associated servers and only returns resources provided by those associated servers. A forward proxy taking requests from an internal network and forwarding them to the Internet. Reverse Proxies broker connections coming from the internet, to your app servers. Forward Proxies filter connections going out to the internet, from clients sitting behind the firewall. Reverse proxies can hide the existence and characteristics of an origin server or servers. Application firewall features can protect against common web-based attacks. Without a reverse proxy, removing malware or initiating takedowns, for example, can become difficult. A reverse proxy can distribute the load from incoming requests to several servers, with each server serving its own application area. In the case of reverse proxying in the neighborhood of web servers, the reverse proxy may have to rewrite the URL in each incoming request in order to match the relevant internal location of the requested resource. A reverse proxy can reduce load on its origin servers by caching static content, as well as dynamic content – also known as web acceleration. Proxy caches of this sort can often satisfy a considerable number of website requests, greatly reducing the load on the origin server(s). Reverse proxies can operate whenever multiple web-servers must be accessible via a single public IP address. The web servers listen on different ports in the same machine, with the same local IP address or, possibly, on different machines and different local IP addresses altogether. The reverse proxy analyzes each incoming request and delivers it to the right server within the local area network. When people talk about a proxy server (often simply known as a “proxy”), more often than not they are referring to a forward proxy. Let me explain what this particular server does. A forward proxy provides proxy services to a client or a group of clients. Oftentimes, these clients belong to a common internal network like the one shown below. When one of these clients makes a connection attempt to that file transfer server on the Internet, its requests have to pass through the forward proxy first. Depending on the forward proxy’s settings, a request can be allowed or denied. If allowed, then the request is forwarded to the firewall and then to the file transfer server. From the point of view of the file transfer server, it is the proxy server that issued the request, not the client. So when the server responds, it addresses its response to the proxy. But then when the forward proxy receives the response, it recognizes it as a response to the request that went through earlier. And so it in turn sends that response to the client that made the request. Because proxy servers can keep track of requests, responses, their sources and their destinations, different clients can send out various requests to different servers through the forward proxy and the proxy will intermediate for all of them. Again, some requests will be allowed, while some will be denied. As you can see, the proxy can serve as a single point of access and control, making it easier for you to enforce security policies. 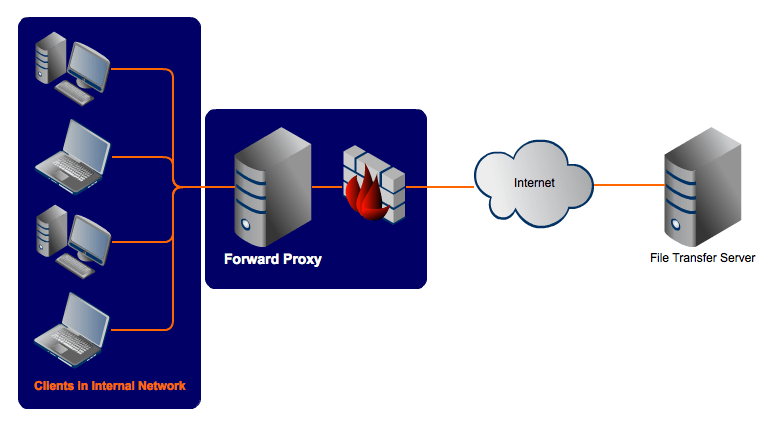 A forward proxy is typically used in tandem with a firewall to enhance an internal network’s security by controlling traffic originating from clients in the internal network that are directed at hosts on the Internet. Thus, from a security standpoint, a forward proxy is primarily aimed at enforcing security on client computers in your internal network. But then client computers aren’t always the only ones you find in your internal network. Sometimes, you also have servers. And when those servers have to provide services to external clients (e.g. field staff who need to access files from your FTP server), a more appropriate solution would be a reverse proxy. An Internet-based attacker would therefore find it considerably more difficult to acquire data found in those file transfer servers than if he wouldn’t have had to deal with a reverse proxy.